Magnus has had a pretty big year: still hovering near the top of the Australian Second Season Sires’ table with 35 individual winners, he has also been represented by stakes winners on successive Saturdays during the Sydney Autumn carnival. 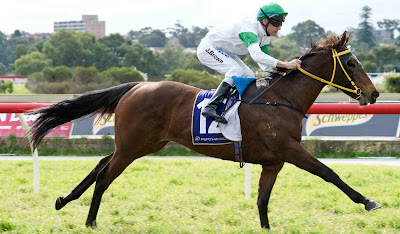 But the connections of classy 3YO, Magnifisio, can well and truly lay claim to paying the bills for one of Magnus’ finest in 2013. The filly again produced a blinding performance at Belmont on Saturday, taking out the Crown Perth Sprint over 1000m – her third win on the trot at Perth’s premier track. Magnifisio made her race debut almost 12 months ago to the day, finishing a promising fourth at Belmont. Since then though, she has stepped out nine times for five wins and three placings and black type appears to beckon. Trained by Jim Taylor, the punting public clearly have an opinion of the horse, sending her out a short priced favourite in seven of her starts. Bred by Rangeview Stud, Magnifisio is out of the stakes winning Key Business mare, Ifestio, a sister to Group One winner Barakey.